What is your role at FSHA? What do your students call you? What made you want to work at FSHA? I was and continue to be delighted by the sense of community and support, especially amongst the students. The small class sizes allow me to teach in the intimate setting I prefer, developing personal relationships with my students and sharing meaningful feedback. What has been your proudest professional accomplishment? I am most gratified by having successfully bridged the curricular, co-curricular, and extra-curricular to create an environment in which empowered young women question everything, support their arguments, and advocate for themselves with articulate and individual voices. 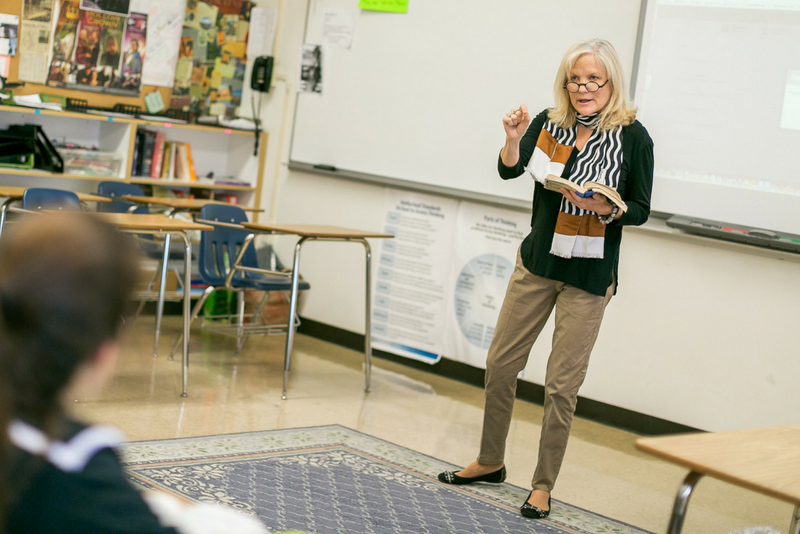 What has been your favorite teaching moment at FSHA? I am pleased to say that there are many. One of my most satisfying moments followed a very searching discussion of Keats' "Ode on a Grecian Urn." Like most of the best moments in the classroom, roles blurred, authority retreated, and we engaged in a sophisticated and egalitarian dialogue on the fragile beauty of being human. I could see and hear young minds stretching to grasp complex interpretations. As class ended, several of the girls started to moan, complaining that their "brains hurt." I teach to cause this type of cognitive discomfort. What most excites you about your work here on the Hill? I love hiring and mentoring young educators, encouraging them to recognize their profound ability to effect change. I love having an impact on young women as they venture out to take on the world. What is FSHA's best kept secret? What do you love about the all-girls environment at FSHA? Women have had the right to vote for less than a hundred years. Only in 1900 did the last state adopt a version of the Married Women's Property Act. Women are disproportionately the victims of violence and sexual assault. Women are vastly discriminated against in the world of technology, and are grossly underrepresented in government. They continue to earn less than men for the same jobs. Here on the hill, for four short years, our young women have the opportunity to thrive, to cultivate their minds and refine their voices, less burdened by the discrimination they continue to experience in the larger world. I believe that women, with their unique talents, are the answer to many of the profound challenges we face in our world. We have our girls for only a short time, but in that time we strengthen them to go forward and be the answer to many of the questions we face in the 21st century. What's your favorite spot on campus? When not in the classroom/office, where can you be found? In the library or working in Kathy Desmond's office, which she generously shares with me when the library and my classroom are in use. What's your favorite place in the world? Home repair and rescuing animals of any kind. Will Stone— a professor from Stanford. What book, movie, work of art, piece of music, etc. can you not imagine life without? What did you want to be when you grew up (at age 12)? What do you want to be when you grow up (now)? Which moment? A writer of books and music, an activist, a world traveler, and always, of course, a teacher.